One of the Archive group's remits is to preserve the oral history of Stillington and Marton through the medium of people's recollections. These provide a fantastic overview, containing many wonderful facts, insights and anecdotes that may well be unique, and would be lost without some effort to record them. If you would like to provide us with a written record of your memories please contact us. The first article is by Mike Webster, who was a pupil at Stillington Hall when it was a Junior Seminary run by the Verona Fathers. As we know very little about The Hall during this time Mike's reminiscences are very valuable and we would like to thank him for allowing us to publish them on our site. The second article is by John J. Sherman who was a pupil at Stillington Hall from aged twelve to fourteen. These recollections a very different from Mike's: much more personal, quirky and possibly quite controversial. However we have decided to put them on our site so our users can read them and judge for themselves! We've recently received some more valuable recollections from an old Pupil of St Peter Claver College - otherwise known as Stillington Hall. Read how he got his nickname on 'Clem's Memories'! The Verona Fathers originated as a brotherhood based in Italy who trained young men for missionary work in Africa. As much of that work was done in British controlled Africa they began setting up schools in Britain from about 1900 onwards to train and ordain English speaking priests who would be better able to undertake this work. The Fathers set up the seminary at Stillington Hall in 1949. It was only meant to be a short, temporary stay while a school was purpose built, however it lasted until 1960 when the new Junior Seminary was opened at Mirfield. Mike was at Stillington Hall from 1956-1960, and describes his stay there as 'the happiest time of my life'. I arrived at Stillington Hall in September 1956, at the tender age of 12 years, in a Standard Vanguard car, courtesy of our neighbour. I was also joined on that date by a young man called Maurice Cole who later changed his name to Kenny Everett. 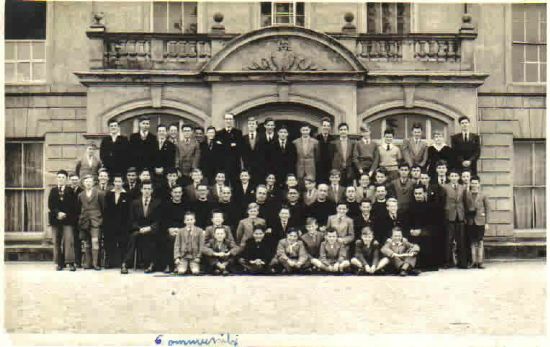 When I arrived in September 1956 there were 58 students, two resident lay teachers, the Father Rector and six teachers who were Verona Fathers. In addition to the local Yorkshire accent there were strong accents from various parts of Scotland, Ireland as well as a couple of students from overseas. The building that stood on the west side of main house was used as classrooms. The main dormitory was on the top floor and stretched along the whole front of the house with smaller rooms also used for sleeping. There was also an infirmary for those taken ill. On the ground floor the room to the left of the main hall was used by visitors whether they be family or on business. Ahead from the main hall was the refectory, as we called it, where everyone ate. The chapel was along a corridor, again off the inner hall.This also led to the showers, other toilets, and the accommodation for the lay teachers. The inner hall and stairway was as magnificent as shown in your photographs. A friend of mine decided to slide down the banister from the top but unfortunately fell off not far from the top and hit the wooden floor below with a sickening thud. He was taken to hospital unconscious and was very fortunate to survive that fall. The kitchen garden grew most of our produce which was prepared by the Nuns/Sisters who had their own part of the house based in the East wing. Many of us spent time at weekends in the kitchen garden helping the Brothers keep it weed-free & eating their vegetables whilst doing the “weeding”. We would walk round the whole grounds when we were involved in “retreats” which was a time of quiet, contemplation, prayer and solitude for up to 3 days. In one of your photographs you show the tennis court at the front left of the picture; that was still there in 1956. We used it for games, PE, & five-a-side rugby. At weekends we would help the Brothers in the stable yard which was situated at the eastern end of the Hall and was able to be approached from South Back Lane. We would amble through the surrounding fields taking in the birdlife, following the River Foss in the river itself as well as along the banks. The choir sang for the local people who came to services and also a family who came in from Brandsby Hall to attend mass and hear us perform. Homework was completed in the classrooms on Saturday morning but everyone looked forward to an afternoon’s football, which was played on a pitch to the left of the main gate and adjacent to the road leading down to the Water Mill, but also down on the field where the present sports pavilion now stands. On occasion we played against the village football team. I remember a young man with the surname Morse played against us and he was said to have had trials at a professional club! We took walks all round the area to - Sutton-on-the-Forest, Huby, Sheriff Hutton, Bulmer, Easingwold, Crayke, Farlington, Stearsby, Brandsby, Helmsley, Rievaulx Abbey, Castle Howard, Jervaulx Abbey. Quite often we walked 20+ miles but did not think it was anything out of the ordinary. I am still a great walker thanks to the wonderful countryside around Stillington. We also visited Flamingo Park Zoo, as it was known at the time, when it first opened as a zoo and we remember that everything was 'under construction'. We took trips to Ampleforth, Hovingham, York, and the North East. I am sure that some of the older residents will remember that period, and when we took our shoes to the cobbler to be repaired, only because his daughter was worth the visit! The four years I spent at the hall and in the village itself were the happiest times of my life and the experience will always have a special place in my heart. I am glad to see that, apart from extra housing, it is still as it was in 1956. A gentle breeze was blowing causing the leaves on the trees to rustle slightly. It was the only noise I could hear. I had no right to be here. I guess it would be best if I started at the beginning. The year was 1951. I was twelve years of age. I was a pupil in St Michael's Catholic School in Liverpool. An announcement had just been made to the class that a missionary was going to show us a film of their work in Africa. The film started and at some point there was a shot of a missionary walking through the jungle, a rifle over his shoulder and the camera zooming in on the occasional lion, elephant or other wild animal. I don’t remember anything else about the film. I was totally captivated by the thought of being in a jungle with a rifle and lots of wild animals.When the film had finished the missionary asked if anyone thought they would like to become a missionary. Some weeks later I was on a train to York wearing the prescribed uniform of short grey trousers and grey blazer. The grey school cap had stayed in my pocket. In Liverpool the wearing of a cap was ridiculed by most schoolchildren. I arrived in York with time to spare before meeting the bus to take me to Stillington Hall. I had heard of York Minster: I made my way to it and climbed the many stairs towards the top. For some reason I took the cap out of my pocket and put it on, after all there was nobody else around. I arrived at the top and was amazed at the view. I walked to the edge to look over the wall. A gust of wind came along, blowing the cap off. I watched it fall to ground below. I never saw it again and I never wore a cap again. Later that day I arrived at Stillington Hall. It was very impressive with its beautiful staircase and the wood panelled walls. I was thrilled to think I was going to live here. All the teachers were Italian priests except for one teacher, Mr Gettings, who was a civilian and taught maths. All the food etc was prepared by nuns. Stillington Hall was almost entirely self sufficient, growing potatoes and vegetables and had a huge orchard full of different kinds of fruit. There were greenhouses where grapes and tomatoes were grown. After a few days it was obvious that all the Italian priests were passionate about football and the new intake was given a trial. I was a reasonably good goalkeeper so I went into the first team. On reflection, had it not been for the football, I think I would have been asked to leave sooner. I was considered something of a rebel - always answering back or asking awkward questions and refusing to participate in things I did not like. There were marks for everything including Piety and in this subject I was always the boy with the lowest mark. There was a system of punishment which basically consisted of three levels. Level one was that you would be made to miss a meal. Two was to be sent to help one of the Lay Brothers to gather fruit or vegetables or help out with other chores. Three was the most serious. This consisted of a black mark system which was used in conjunction with the “ Treats” that were arranged from time to time. A “Treat” should not be confused with “Retreat”. Treats consisted of something nice like a particular day out or a film show. If you had three black marks against your name when a treat came to pass then you had to miss the treat. I never participated in a treat in all the time I was there. The closest I ever got was when they announced that the next treat would be the following Friday and it was to be the showing of the film, “ Scott of the Antarctic.” I had heard of this film and wanted desperately to see it. As soon as assembly was over I went to the notice board. Mine was the only name in the black mark section - I had two black marks. ' Surely I could be on my best behaviour for one week', I thought to myself. I was doing alright until the day before the treat. It was the start of a maths lesson - Mr Gettings had written some stuff on the blackboard and asked me to read out what he had written. I did. He asked me read it again. I did, but at the same time I noticed he had made a mistake. He then took off his glasses and offered them to me saying something like " Try again with these" . I blurted out " You are the one that needs the glasses, sir, not me". Third black mark. Goodbye Scott of the Antarctic! The day of the treat I was sent to the Rector’s office. He told me I had missed more meals than many of the other boys put together. I had been sent to do more chores than some of the Lay Brothers had done I had never enjoyed a single treat since I was at Stillington Hall. He asked me why I could not do everything as well as I played football. I didn't have the courage to tell him the truth. For my punishment I was to go into the grounds of the Hall and take my bible to spend the next two hours or so reading it whilst the film was being shown. So here I am, sitting on this branch of a fallen tree asking myself questions. It was then that the thought struck me that I should have brought something more interesting to read. I knew where all the keys were secretly hidden because I had helped out the Lay Brothers on so many occasions. I knew where the library key was hidden. I could sneak up there while they were all watching the film. Full of bravado I set off. I retrieved the key from it’s hiding place but, by the time I put the key in the lock all the bravado had left me, I felt quite nervous. I pushed open the door, grabbing the nearest book to me without knowing what book it was. I locked the door, put the key back and ran back to the woods as quickly as I could. Once there I took out the book and was horrified to see it was a book of selected poems. I hated poetry! I was disgusted with myself for being such a coward. I flicked idly through the pages and caught sight of the name “Homer”. I knew Homer had written The Iliad and The Odyssey so I went to a poem to see what all the fuss was about. But it wasn't by Homer: it was about Horatius defending the bridge of Rome. I actually liked it so much I read it many times over and could recite it word for word. There was an excellent standard of education at Stillington Hall but like most of my experiences there I did not appreciate the value of this until much later in life. The food was not good - bread and jam was a luxury. We were not supposed to keep any money in our possession but I always did and we were not allowed out of the grounds except on Sunday walks. One of my most vivid memories was sneaking out of the main gate and going to a little shop in the village opposite the gates to buy a packet of chocolate biscuits. I missed so many meals I was always hungry. On one occasion during the Winter I had missed several meals and while everyone was eating lunch I went down to the greenhouses where all the fruit was stored. I took the key from it’s hiding place and sat and ate my fill of fruit. During the time I was inside it had snowed heavily and I was leaving tracks in the snow. I hoped it would go on snowing to cover up the tracks I had made. It didn't! That evening we all sat down for the evening meal which I was looking forward to with some relish. Before grace was said the Rector came into the refectory and called everyone to attention. He said a boy had raided the fruit storeroom that day and until that boy owned up no one would eat. I am certain he already knew it was me. Anyway I stood up and was told to go to the Rector’s office. Bang went another couple of meals and another black mark against my name! Perhaps it was the realisation that I was there under false pretences that contributed to my behaviour or maybe I was just an unruly child. Basically, I was bored from time to time especially with the religious side of life there. It wasn't that I had anything against religion; it was just a bit too much at times. I would often apply myself to thinking of ways that would get me out for a short time. For instance saying I thought I might need glasses got me a couple of trips to York to the opticians. Another occasion got me to the Dentist. I was running out of ideas when I heard that back pains were difficult to detect. I thought that could be a good one. I went to Father Valmaggia and told him I was experiencing a bit of an ache at the bottom my back. He took me to see a doctor in York. I was pleasantly surprised as the Doctor was a woman and quite pretty. My enthusiasm soon waned as she told me to remove my trousers and underpants and lay on the bed with my back to her. I saw her put on a rubber glove and you can guess the rest! It cured me from dreaming up excuses for day trips out! The majority of the boys there were quite pious and I remember some of their names. There was Tom Marshall and Peter McGloughlin from Liverpool. John Waters and Pat McCabe from somewhere near Middlesborough, James Wallace from Northern Ireland, a boy with the surname of Hilliard who I think was also Irish. There was another boy from Southern Ireland who was unbelievably anti British. He would come out with some things which I did not even understand at the time. He and I used to argue a lot and one day I found a drawing on my bed showing Ireland almost the full size of the paper and England like a small dot alongside it. I wanted to get my own back but could not think of anything appropriate until one day I saw a loose wire near the door of the building on the right of the hall photo. I started to examine the wire and nearly jumped out of my skin when the end touched the metal on the door and sparked. I reported it to one of the Lay Brothers who was nearby and he told me it was only low voltage electricity and whilst you would get a bit of a shock from it, it could’nt do any real harm and he just tucked it away in a hole. Later that day I checked to make sure the wire would reach to the door handle which it did and an idea was born! I told two of my friends about the idea I had and we arranged for the Irish boy ( who fancied himself as a bit of an athlete ) to have a race with my friend which had to start by the pond and finish inside the room where I had electrified the door handle. Needless to say, the Irish boy won and we were all there to have a laugh as he opened the door and screamed his head off. He just did not have a sense of humour! Of the priests that were there I remember Fr Valmaggia with some affection, Fr Cerea, who taught English, and, of course, our Maths teacher, Mr Gettings. In the staff and pupils photo that Dave Green sent, Fr Valmaggia is the bald headed priest sitting fourth from the right as you look at the photo. I think the priest sitting seventh from the right could be Fr Cerea, but I cannot be certain of this. I don’t recognise any of the others. I knew Kenny Everett attended Stillington Hall but that was about four years after I was there. I think he and I would have gotten on well together. I heard he was expelled for drinking the altar wine but I don’t think he was alone in that respect. I remember on most of our Sunday walks if we came across a non catholic church we would go in and if there was no one around, some of the boys would look for the altar wine and drink a little. I tried it once but did not like the taste of it. In any case I was too busy outside looking for a particular kind of leaf from which I used to make tobacco! My time at Stillington Hall was not the best in my life but it is full of cherished memories. In my later life I realised just how important a role my time there had been in shaping my character and providing me with experiences of the need for self discipline, preservation and team work. For that I will be eternally grateful. Stillington Hall may not have turned out very many Missionaries but I am sure that every boy that passed through there left being a far better person, and most certainly much better equipped to face the adulthood in front of them.